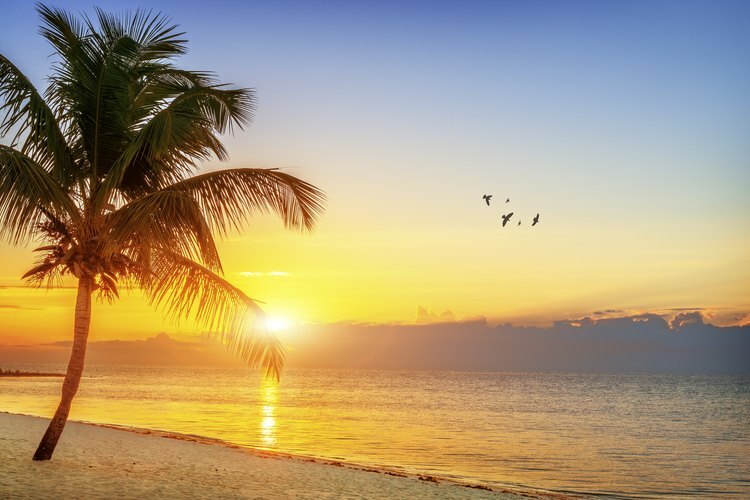 Sunrise over a beach in the Florida Keys. The Florida Keys, a a 100-mile stretch of limestone islands off mainland Florida, offers lodging on all of its populated keys. Although mom-and-pop hotels and luxury resorts dot the island chain, camping in the Florida Keys costs less than any hotel on the islands. If you know where to look, you can find camping in some of the Keys' natural areas for less than half the cost of other campsites. As of August 2010, state park RV camping in the Florida Keys cost $36 per night; comparable sites at privately-run KOA campgrounds cost $100 per night. State parks that offer RV camping in the Florida Keys include John Pennekamp Underwater State Park, Curry Hammock State Park, Long Key State Park and Bahia Honda State Park. Florida state parks allow people to reserve camp sites up to 11 months in advance. Florida state parks in the Florida Keys charge the same rate for tent camping as they do for RV camping, but as of August 2010 tent sites cost $23 less than a comparable KOA site. At Key Biscayne National Park, you can camp for $15 per night on Boca Chita Key. You will need a boat to access the island; if you have your own, you may dock it there for $20 per night. You may also arrange for ferry service to drop you at the island. If tent camping is your thing but you prefer it a little more primitive than on the mainland, consider the Dry Tortugas National Park, which is located 70 miles off the coast of Key West. You can access it by private boat or ferry, and you must bring everything you need, including water. In 2010, the fee was $3 per person, plus the cost of the ferry ride. Ferry rates vary and can run almost $200 for a a round trip per person, so this may only be a cheap option for people who have their own boat or plan on staying for several weeks. Wal-Marts, Cracker Barrels, K-Marts, and other large retailers often allow RVs to park overnight free of charge. Part of the appeal of the Florida Keys is the marked scarcity of such retailers, although Key Largo, Marathon and Key West have a few large retailers and grocers. Marathon has a Publix, Home Depot and a K-Mart; Key West and Key Largo have Publix grocery stores. Call the store manager and ask how long RVs may remain on the property. Although there is generally no fee for this type of camping, there will not be any power, water or dump station. Key Biscayne National Park, John Pennekamp Underwater State Park, Bahia Honda State Park and Dry Tortugas National Park all allow boat camping. Boat camping at Key Biscayne and Dry Tortugas national parks is on a first-come, first-serve basis. Boat camping in Key Biscayne cost $20 per boat as of August 2010; the Dry Tortugas does not charge a fee. Both islands have limited facilities. Boat camping at Bahia Honda State Park costs $2 per foot with a $30 minimum; John Pennekamp Underwater State Park asks that boaters call for rates.